Dramatic footage from Donetsk shot by the RT crew, who were among the first reporters at the scene, shows a destroyed city market, private houses on fire and emergencies services trying to cope with the aftermath of the shelling. 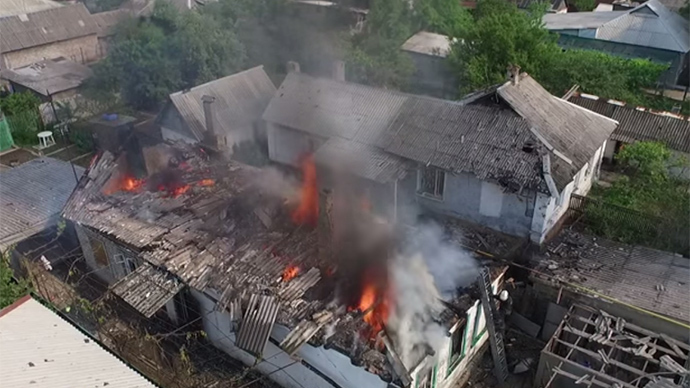 Kiev forces shelled the Ukrainian city on Wednesday, mostly the Petrovsky and Kirovsky districts in the southwest, killing at least 6 people and injuring 90 others. “Everywhere you look you could see plumes of smoke rising towards the sky,” RT's Ilya Petrenko reported after visiting the shelled areas. The bombardment caused a great deal of destruction at the city’s Sokol market as several rows of small shops were burnt down. “When we arrived they were on fire. Fire brigades tried to extinguish the blaze,” RT’s correspondent said. “People were baffled. They didn’t know what to do. Some were hiding in basements, which saved one family, whose house was completely destroyed. Others were looking for cars and vehicles to escape the area,” Petrenko added. The current escalation of violence is one of the largest since agreements, signed between Ukrainian authorities and the rebels in the Belarusian capital in mid-February, led to a decrease in fighting, which saw over 6,000 killed since April 2014.